If you'd like to disappoint your date this Valentine's Day, take them to see As You Like It at the Folger Shakespeare Theater. 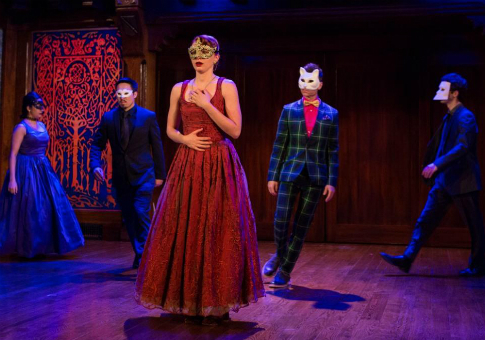 If you'd like a way to subtly convey to them that the magic has gone out of your relationship and it's time to move on, take them to see As You Like It at the Folger Shakespeare Theater. If you'd like to take an expensive nap, see As You Like It at the Folger Shakespeare Theater. Otherwise, I'd skip this one. These are harsh words for a production that doesn't do anything egregiously awful. But while Gaye Taylor Upchurch's As You Like It has some promising elements, it fails to charm or move us. It is worse than bad, it is dull. It is dull because the leading couple, Rosalind and Orlando, have all the chemistry of Anne Hathaway and James Franco hosting the Oscars. For those unfamiliar with the comparison: our bubbly and very professional Rosalind (Lindsay Alexandra Carter) does her manful best, but her dopey, glassy eyed Orlando (Lorenzo Roberts) gives her very little to work with. The feeling he conveys most strongly is "lethargy." He can smile when he is happy and frown when he is sad, but there is no urgency in his movements, no fear or lust in his eyes. Even when Orlando is supposed to be aggressive and violent, he is as oblivious and serene as a napping puppy. Rosalind may as well be emoting against a cuddly but insensible stuffed animal. In the director's note, Upchurch tells us that As You Like It is a tale of "displaced people," raising questions about "what it's like to be a refugee." Blessedly, this interpretation does not make itself known on stage, or if it does, it's very tasteless. 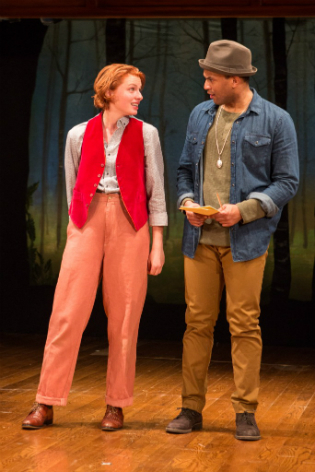 Most of As You Like It takes place in the semi-magical Forest of Arden, an edenic place full of friendly strangers, free food, and extended musical numbers. If As You Like It has anything to say about exile, it's that it is a delightful romp. It's hard to believe this interpretation was meant in earnest. It is as if Upchurch felt she needed to invent a reason for us to invest emotionally or intellectually in the play. If she doesn't think the play can resonate with us on its own, it's no wonder that this production seems so unsure of itself. The lovely music (Shakespeare's lyrics set to jazz- and blues-style tunes by Heather Christian) and strong supporting cast members (especially Brian Reisman as the miserable, lovesick Silvius and Dani Stoller as his unwilling paramour, Phoebe) don't make up for the flatness of the core couple. This is a shame, because when done well, Rosalind and Orlando have one of the most satisfying and well-developed courtships in all of Shakespeare. Like many of his couples, they fall in love at first sight and are separated soon afterward. But they quickly find each other again in the Forest of Arden, where they test each other's notions about love and marriage until, one thinks, they might actually take the leap. Of course, it is possible that only Rosalind realizes that all their talk of marriage is meant to lead to the real thing. When they first meet in the woods, Rosalind is disguised as a boy called Ganymede. Orlando doesn't recognize her, or at least he pretends not to (some productions will play with this ambiguity: when does Orlando see through Rosalind's disguise? Does he ever? I think he does, right away). After observing Orlando wandering around, posting terrible love poems in trees, "Ganymede" offers to tutor Orlando in his wooing. He suggests that Orlando call him "Rosalind" and practice his seduction techniques on him. Although it may seem arbitrary, there's a reason for her disguise. Arden is a hospitable place for love affairs, where nature is supreme and propriety laughed at. But a side plot about the clown Touchstone's attempt to trick a woman into a false marriage so that he can bed her and then disappear reminds us that we are outside the city walls, where promises and contracts are easier to break. Rosalind's disguise helps protect her and distance her from the seductions of the forest. At the same time, she can flirt more boldly and criticize Orlando more sharply when she is only "playing" Rosalind. Arden is a place of freedom and music, but the pastoral songs that waft through the trees are largely about temporary love, about satisfying the needs of the body and not much beyond that: "Most friendship is feigning, most loving mere folly: Then, heigh-ho, the holly! This life is most jolly." What makes the Arden special also makes it dangerous. Once you enter, you might be tempted to stay forever. You might not have a choice. Rosalind and Orlando become exiles because her father, the Duke Senior, is a little too in love with the forest. He has been overthrown by his own brother (whose name is not, disappointingly, Duke Junior) and does not seem to be interested in coming back. When her father was banished, Rosalind was allowed to stay because the Duke's daughter was fond of her. And yet her status at court is tentative, dependent on the evil duke's caprice. It is a terrible way to live. Indeed, her life is in danger before the end of Act I, and she is banished. One might expect Rosalind's father to worry about leaving his only child in such a condition, but when we finally meet him, we find him luxuriating in his freedom, his life in the wild. He does not mention her at all. When she meets her father in the woods, they are cold to each other. She reveals herself to him only when it is time for him to give her away. When the city is ruled by a brother-betrayer, other families in the city break down, too (notice that there are no mothers in this play, and no marriages to start with). Orlando's exile begins when he runs to the forest after learning his cruel older brother is plotting to murder him. In the woods, Orlando finds a place in the exiled Duke's merry band of foresters. But while these men find comfort and refuge in the wilderness, Rosalind's eye is on return the whole time. It is Rosalind's prodding (one might call it teaching) that sets Orlando's mind on marriage, on leaving the woods and approaching the altar. Meanwhile, Orlando's patience and bravery give Rosalind a husband she can trust and believe in. This play pays special attention to the connection between marriage and political life. Thanks to a little divine intervention, the couple soon finds itself on the way back to the city, next in line for the throne. In As You Like It, marriage is the sticking agent that turns wildernesses into cities, lost individuals into families. In a better production, we would happily wave them off into the sunset. Here, when we get to the end, we applaud because we are glad it is over and want to go home. This entry was posted in Culture and tagged Theater Reviews. Bookmark the permalink. Kate Havard is a research analyst at the Foundation for Defense of Democracies and a graduate of St. John’s College in Annapolis.